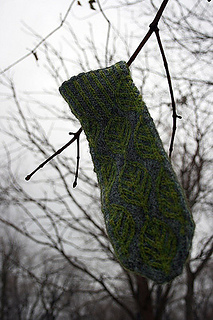 Mittens are a great way to experiment with new techniques. 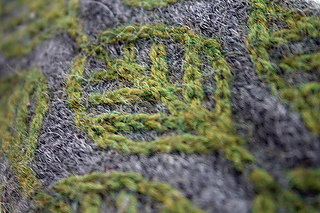 The leaf motif is created by combining twisted stitches and two-color knitting. These mittens will keep your hands toasty until the leaves come back. In sizes: 8 (8 1⁄4, 8 1⁄2, 9, 9 1⁄4, 9 1⁄2) in (20.3 21, 21.6, 22.9, 23.5, 24.1 cm) around. 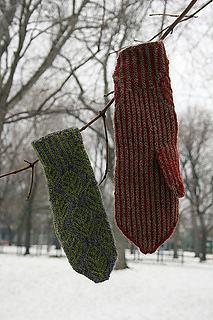 Depending on desired gauge and thickness and body of mitten desired, anything from dk weight to worsted can be used. I’ve tried both and like the lightness of the dk weight for fall and the thickness and warmth of the worsted for a more wintery mitten. In worsted weight – 1 hank 3.5 oz (100g), 215yd (196 m) of each color. In dk weight – 1 hank 1.75 oz (50g), 144 yd (133 m) of each color.